Low vitamin D levels may increase the risk of bacterial vaginosis, a common vaginal infection linked to adverse pregnancy outcomes, suggests a new study. In a study with 469 women participating in a pregnancy cohort study, vitamin D levels below 20 nmol/L were associated with a 34 percent increase in the prevalence of bacterial vaginosis, compared to women with vitamin D levels over 80 nmol/L. According to researchers led by Lisa Bodnar, from the University of Pittsburgh Graduate School of Public Health, a potential protective effect of vitamin D may be due to the vitamin’s influence on the immune system. The study adds to an ever growing body of science supporting the benefits of maintaining healthy vitamin D levels. Swine Flu Caused by Smithfield Foods Subsidiary? Is Smithfield Foods, the world’s largest pork packer and hog producer, linked to the outbreak? Granjas Carroll de Mexico, a Smithfield CAFO (Confined Animal Feeding Operation) hog farm in Perote, Mexico (where the outbreak originated) raised and sold 950,000 hogs last year. That’s nearly a million hogs! I’ve been following with huge interest the Swine Flu epidemic that originated in Mexico City and is now confirmed in the United States. 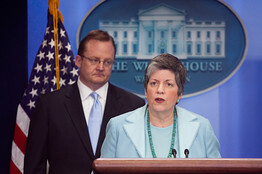 Photo: Getty Images Homeland Security Secretary Janet Napolitano, joined by White House Press Secretary Robert Gibbs, briefed reporters at the White House on the government's response to swine influenza. This is serious stuff, because this is not your ordinary flu bug – it’s a combination of pig (swine), bird (avian) and human viruses, of which we humans do not have a natural immunity for. Reports are showing at least 1,400 people infected in Mexico and from 80-200 people dead. Earlier today, the Obama administration declared a “public health emergency,” as U.S. health officials warned that further cases of swine flu are likely to emerge in the U.S. Homeland Security Director Janet Napolitano described the declaration as “standard operating procedure” to allow the federal and state governments easier access to flu tests and medication. Richard Besser, acting director of the Centers for Disease Control and Prevention, said that over time “more severe” cases of disease are likely to surface. He said that officials so far have identified 20 cases in the U.S.